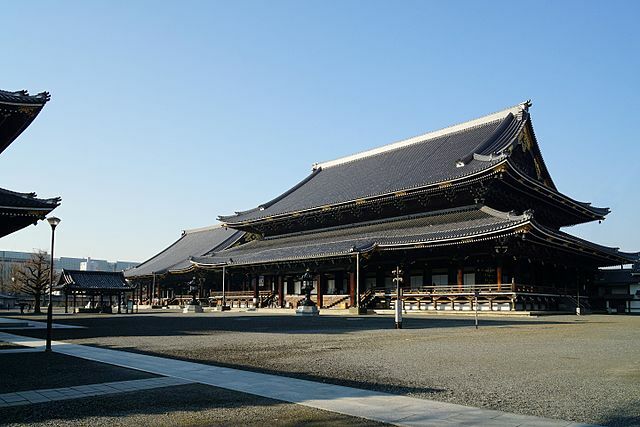 While many travelers have heard of the Golden Pavilion or Silver Pavilion in Kyoto, very few have heard about the two large temples of Nishi Honganji or Higashi Honganji. Honganji is the collective name of the largest school of Jodo Shinshu Buddhism which further sub-divides into the Nishi and Higashi branches. As headquarters of the two factions of the Jodo-Shin Sect "True Pure Land Sect", one of Japan's largest Buddhist sects, they are a good place to experience contemporary Japanese Buddhism. Nishi Honganji "West Temple", was built in 1591 after the sect's former head temple, Ishiyama Honganji in Osaka had been destroyed by Oda Nobunaga "a powerful feudal lord", due to the temple's interference in politics. Osaka Castle now stands atop the site of the Honganji. Nishi Honganji is the head temple of the Honganji faction of the Jodo-Shin Sect with over 10,000 sub-temples across Japan. 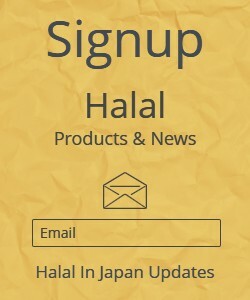 It has also a sizable number of overseas temples in the U.S.A., South America, Hawaii, Canada, and Europe which are organized into several kyodan "districts". 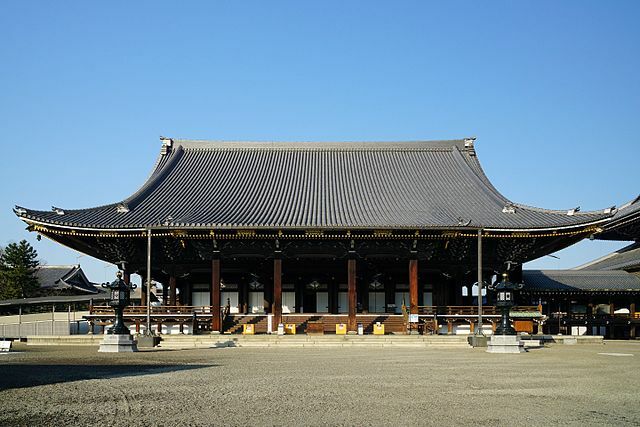 The Nishi Honganji features two huge structures; the Goeido Hall, dedicated to Shinran, the sect's founder, and a smaller Amidado Hall housing an image of Amida Buddha. The temple displays a large shogun complex from the medieval period, including the celebrated Hiunkaku Pavilion. The Shoin "study hall", is also quite famous; it is split into two sections, the Shiro-Shoin "white study hall", and the Kuro-Shoin "black study hall". 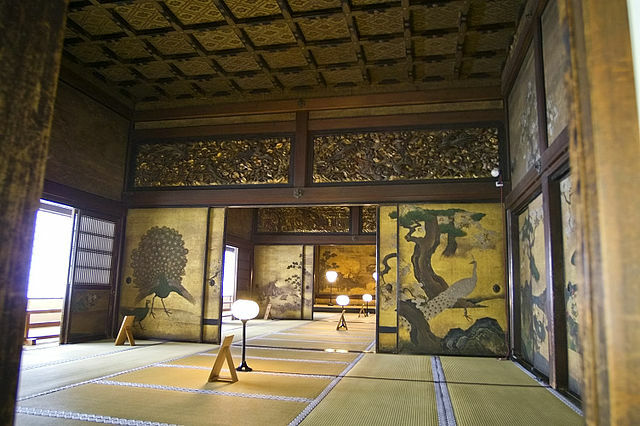 Nishi Honganji is listed as an UNESCO world heritage site. 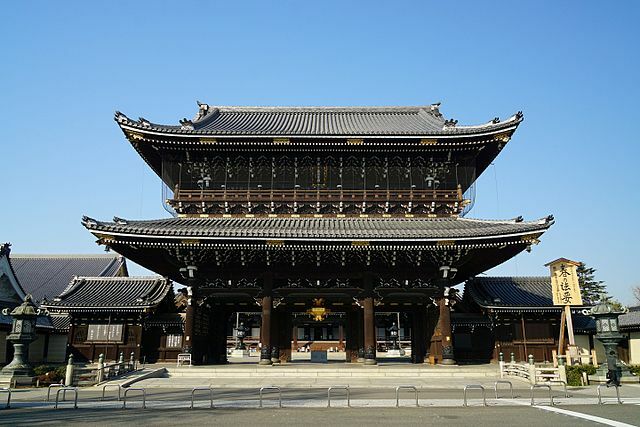 ​Higashi Honganji "East Temple", was built eleven years after and a few street blocks east of Nishi Honganji as the head temple of the Otani faction of Jodo-Shin Buddhism. In 1602 shortly after Tokugawa Ieyasu became Shogun, he split the main Honganji in Kyoto into two temples in order to diminish the power of the Jodo Shin Sect. The massive Goeido Hall is often one of the first things one sees walking north from Kyoto Station. 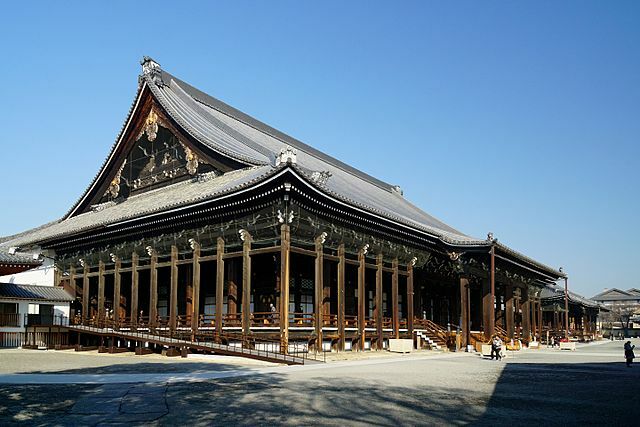 ​The Goeido is Kyoto's largest wooden structure and dedicated to Shinran, the sect's founder. ​Nearly identical to the Nishi Honganji head temple in layout, it too features an Amidado Hall, dedicated to the Amida Buddha. A few street blocks east from the main grounds of the Higashi Honganji is the Shoseien Garden, owned by the temple. It serves as a detached temple residence of Higashi Honganji. The garden covers an area of about 33,000 square meters and is filled with many kinds of flowers. Today, the garden with its pond and beautiful autumn colors is open to the public. ​Admission to Nishi Honganji and Higashi Honganji is free. But there is a 500 yen entrance fee for the Shoseien Garden which will be used for the maintenance and preservation of the garden. 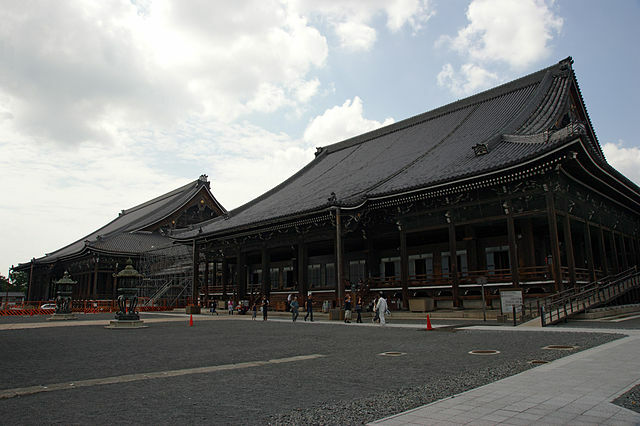 The Honganji temples are located a 10-15 minutes’ walk north of Kyoto Station.